This tutorial will explain how to use the NumPy concatenate function in Python (which is sometimes called np.concatenate). This post will cover several topics. If you don’t want to read the full tutorial, click on the appropriate link and it will send you to the relevant section of this tutorial. First, I’ll start by explaining what the concatenate function does. So what is the concatenate function? The NumPy concatenate function is function from the NumPy package. NumPy (if you’re not familiar), is a data manipulation package in the Python programming language. We use NumPy to “wrangle” numeric data in Python. 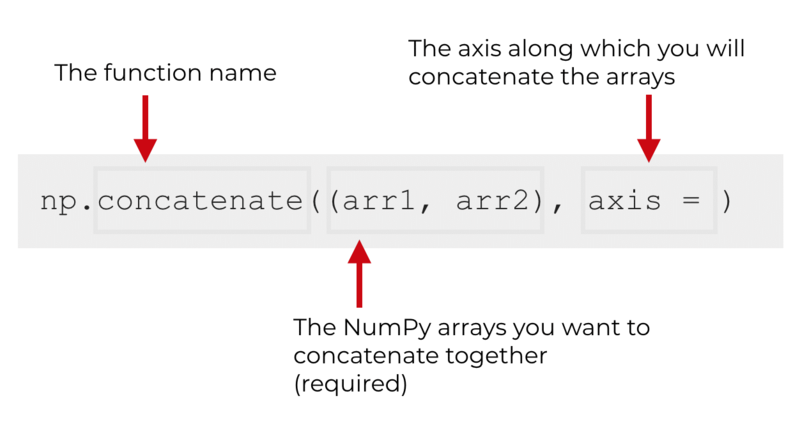 NumPy concatenate essentially combines together multiple NumPy arrays. 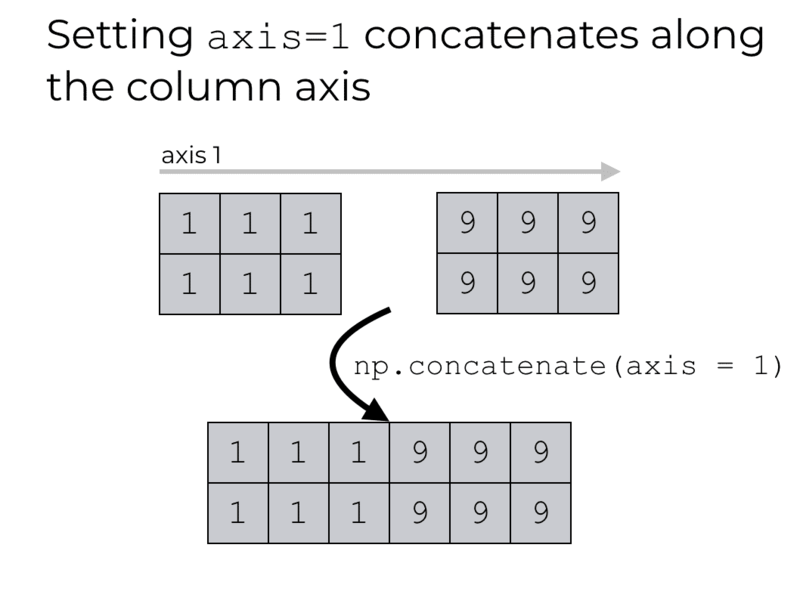 First, NumPy concatenate isn’t exactly like a traditional database join. It’s more like stacking NumPy arrays. Second, the concatenate function can operate both vertically and horizontally. You can concatenate arrays together vertically (like in the image above), or you can concatenate arrays together horizontally. Later in the examples section, I’ll show you how to use concatenate both ways. Before we discuss concrete examples though, let’s quickly look at the syntax of the np.concatenate function. The syntax of NumPy concatenate is fairly straightforward, particularly if you’re familiar with other NumPy functions. Syntactically, there are a few main parts of the function: the name of the function, and several parameters inside of the function that we can manipulate. In Python code, the concatenate function is typically written as np.concatenate(), although you might also see it written as numpy.concatenate(). Either case assumes that you’ve imported the NumPy package with the code import numpy as np or import numpy, respectively. Moving forward, this tutorial will assume that you’ve imported NumPy by executing the code import numpy as np. When you use the np.concatenate function, you need to provide at least two input arrays. 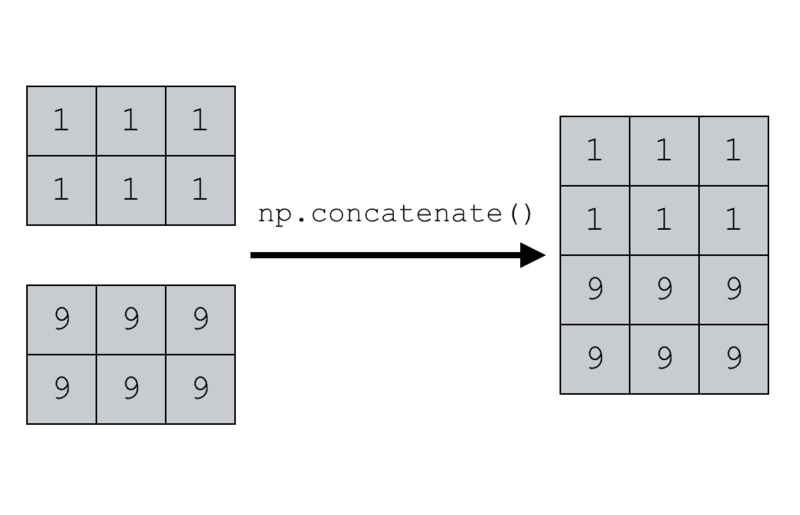 There are a few important points that you should know about the input arrays for np.concatenate. Notice that the arrays – arr1 and arr2 in the above example – are enclosed inside of parenthesis. Because they are enclosed in parenthesis, they are essentially being passed to the concatenate function as a Python tuple. Alternatively, you could enclose them inside of brackets (i.e., [arr1, arr2]), which would pass them to concatenate as a Python list. Either method is acceptable: you can provide the input arrays in a list or a tuple. What’s important to understand is that you need to provide the input arrays to the concatenate function within some type of Python sequence. Tuples and lists are both types of Python sequences. If you’re a little confused about this, I suggest that you review Python sequences. Another point that I’ll make is that the input arrays should probably contain data of the same data type. But keep in mind that the data types probably should be the same, but they don’t have to be. The issue here is that, if the input arrays that you give to NumPy concatenate have different datatypes, then the function will try to re-cast the data of one array to the data type of the other. For example, let’s say that you create two NumPy arrays and pass them to np.concatenate. One NumPy array contains integers, and one array contains floats. When you run this, you can see that all of the numbers in the output array are floats. Why? Some of the inputs were integers, right? Ultimately, you need to be careful when working with NumPy arrays that have different data types. The behavior of NumPy concatenate in those cases may have unintended consequences. In the examples I’ll show later in this tutorial, we’ll mostly work with two arrays. We’ll concatenate together only two. Keep in mind, however, that it’s possible to concatenate together a large sequence of NumPy arrays. More than two. You can do three, or four, or more. Having said that, if you’re just getting started with NumPy, I recommend that you learn and practice the syntax with very simple examples. Stick with two arrays in the beginning. Now that we’ve talked about the input arrays, let’s talk about how the np.concatenate() function puts them together. As I mentioned earlier in this tutorial, the concatenate function can join together arrays vertically or horizontally. The behavior of np.concatenate – whether it concatenates the numpy arrays vertically or horizontally – depends on the axis parameter. I have to be honest. One of the hardest things for beginners to understand in NumPy are array axes. For a variety of reasons, array axes are just hard to understand. The naming conventions (axis 0, axis 1, etc) are a little abstract. And the documentation about axes is not always 100% clear. Ultimately, these factors make array axes a little un-intuitive. Be that as it may, to understand how to use NumPy concatenate with the axis parameter, you need to understand how NumPy array axes work. With that in mind, let’s try to shed a little light on array axes. First, let’s start with the basics. NumPy arrays have what we call axes. 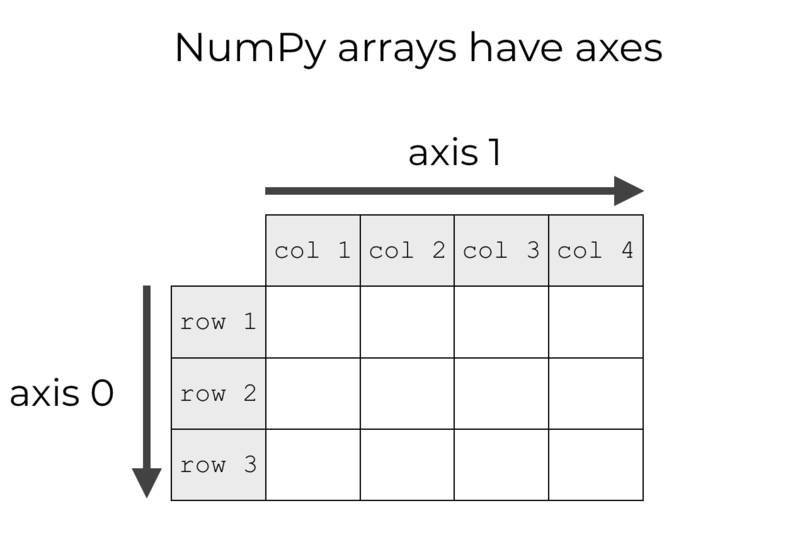 The term “axis” seems to confuse people in the context of NumPy arrays, so let’s take a look at a more familiar example. Take a look at a Cartesian coordinate system. 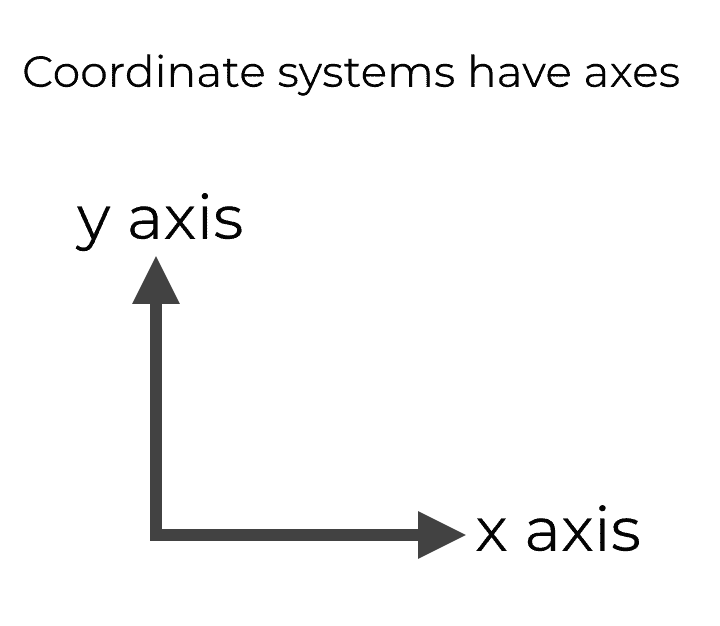 A Cartesian coordinate system has axes. Specifically, we typically refer to the horizontal axis as the x axis, and the vertical axis as the y axis. Almost everyone should be familiar with this. In Cartesian space, these axes are just directions. Moreover, an observation at a point in a Cartesian space can be defined by its value along each axis. So for example, we can identify a point in a Cartesian space by specifying how many units to travel along the x axis, and how many units to travel along the y axis. Axes in a NumPy array are very similar. Axes in a NumPy array are just directions: axis 0 is the direction running vertically down the rows and axis 1 is the direction running horizontally across the columns. Ultimately though, when we say “axis 0” we’re talking about the direction that points down the rows, and when we say “axis 1” we’re talking about the direction that points across the columns. And just like in a Cartesian coordinate system, we can use this system of axes to identify particular cells in the dataset. We can identify a particular location in a NumPy array by specifying how many units on the 0-axis and how many units on the 1-axis. It’s very similar to how we identify particular points at locations in an x/y coordinate space. Now that we’ve talked about axes in general, let’s talk about how they operate with respect to the concatenate function. Remember what I mentioned earlier in this tutorial: we can concatenate NumPy arrays horizontally or we can concatenate NumPy arrays vertically. Which one we do is specified by the axis parameter. If we set axis = 0, the concatenate function will concatenate the NumPy arrays vertically. On the other hand, if we manually set axis = 1, the concatenate function will concatenate the NumPy arrays horizontally. A lot of people still find this to be un-intuitive, so I’ll quickly explain it another way. 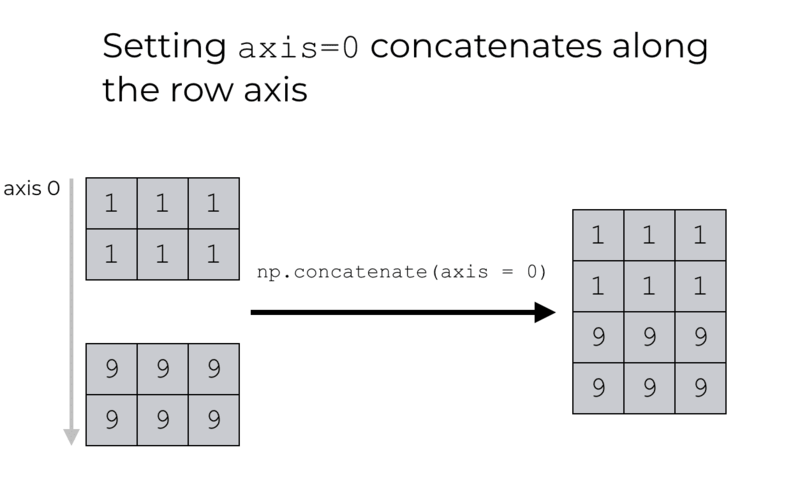 The best way to think of NumPy concatenate is to think of it like stacking arrays, either vertically or horizontally. The axis that we specify with the axis parameter is the axis along which we stack the arrays. So when we set axis = 0, we are stacking along axis 0. Axis 0 is the axis that runs vertically down the rows, so this amounts to stacking the arrays vertically. Similarly, when we set axis = 1, we’re stacking along axis 1. Axis 1 is the axis that runs horizontally across the columns, so this amounts to stacking the arrays horizontally. If this still seems a little confusing, that’s OK.
To help clear things up, we’re going to move on to some concrete examples that you can run yourself. Understanding how np.concatenate works will be easier when you have some real examples that you can play with. Ok, let’s work with some real examples. Before you get started with these examples, you’ll need to import the NumPy package into your development environment. This will enable you to refer to NumPy as np when when you call the concatenate function. First, let’s just concatenate together two simple NumPy arrays. To do this, we’ll first create two NumPy arrays with the np.array function. Basically, we have two simple NumPy arrays, each with three values. Now, let’s combine them together using NumPy concatenate. Notice what’s happened here. The concatenate function has combined the two arrays together vertically. Essentially, the concatenate function has combined them together and has defaulted to axis = 0. Next, we’re going to concatenate the arrays together vertically again, but this time we’re going to do it explicitly with the axis parameter. In this example, we’re going to reuse the two arrays that we created earlier: np_array_1s and np_array_9s. To explicitly concatenate them together vertically, we need to set axis = 0. Notice that this is the same as if we had used concatenate without specifying the axis. By default, the np.concatentate function sets axis = 0. Finally, let’s concatenate the two arrays horizontally. To do this, we need to set axis = 1. Remember that axis 1 is the axis that runs horizontally across the columns. So when we set axis = 1, the concatenate function is essentially combining the two arrays in that direction … horizontally. Before ending this NumPy concatenate tutorial, I want to give you a quick warning about working with 1 dimensional NumPy arrays. If you want to concatenate together two 1-dimensional NumPy arrays, things won’t work exactly the way you expect. Why are they being concatenated together horizontally? If we set axis = 0, shouldn’t this concatenate them together vertically? This is a little subtle, and it all comes down to axes. Think about what we have here. Both of the input arrays are one dimensional. Because they are one dimensional, there is only one axis. Axis 0 is the only axis they have! Moreover, in the case of a 1-d array, axis 0 actually points along the observations. It points in the direction of the index. So when we use np.concatenate in this case, it is still concatenating them along axis 0. The issue is that because they are 1-d arrays, axis 0 points horizontally along the observations. In any event, concatenate function works “fine” in this case, but you need to really understand NumPy axes to understand its behavior. A related issue is when you try to concatenate together two 1-dimensional NumPy arrays with axis = 1. If you try to concatenate together two 1-d NumPy arrays vertically, using axis = 1, you will get an error. Again, this is a bit subtle, but it makes sense if you think about it. The input arrays that we’ve used here are one dimensional. When we use the syntax axis = 1, we’re asking the concatenate function to concatenate the arrays along the second axis. Remember that in NumPy, the first axis is “axis 0” and the second axis is “axis 1.” The axes are numbered starting from 0 (just like Python indexes). Here’s the problem though: in a 1-dimensional NumPy array, there is no second axis. 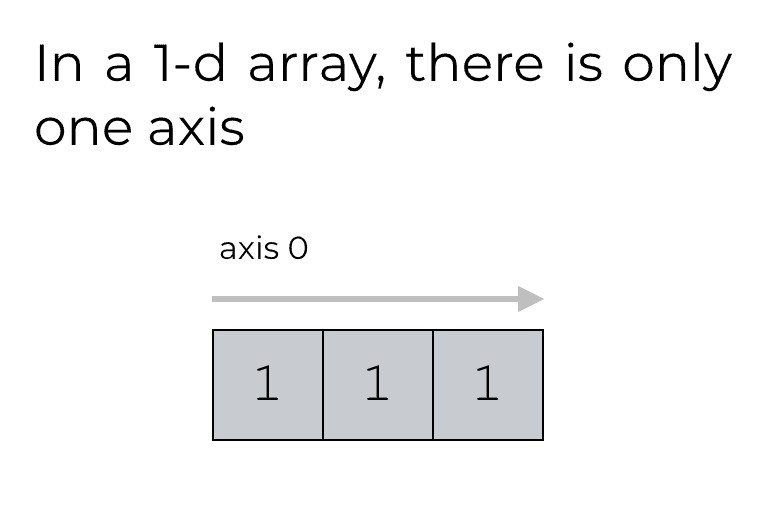 In a 1-d array, the only axis is axis 0. There is no second axis (“axis 1”) along which we can concatenate the arrays. Once again, this is subtle, but it makes sense when you understand how NumPy axes work. Just be careful, and make sure you think through the structure of your arrays before you use NumPy concatenate. NumPy concatenate is only one data manipulation tool in Python’s NumPy package. If you want to be great at data science in Python, you’ll need to learn more about NumPy. Having said that, check out our other NumPy tutorials on things like how to create a numpy array, how to reshape a numpy array, how to create an array with all zeros, and many more. More broadly though, if you’re interested in learning and mastering data science in Python, you should sign up for our email list right now. Here at the Sharp Sight blog, we regularly post tutorials about a variety of data science topics … in particular, about NumPy. If you sign up for our email list, our Python data science tutorials will be delivered to your inbox.